What is Handgun Shooting Academy? Handgun Shooting Academy's lead instructor is a highly trained professional dedicated to teaching you first how to avoid a confrontation if possible as well as teach you the skills necessary to survive a lethal confrontation. Handgun Shooting Academy caters to clients from all walks of life and professions. You will receive instruction on firearms safety, proper fundamentals, awareness and avoidance, and the use of firearms for competitive and defensive shooting through personalized training. Courses offered include three levels of handgun classes focusing on defensive shooting beginning with Level I and progressing through Level III. Each course builds on the previous giving you the necessary skills to develop confidence and proficiency as well as the Combat Mindset necessary to survive a lethal confrontation. CCW courses as well as defensive shotgun are also offered. Who attends training at Handgun Shooting Academy? Great value for the high level of instruction. Learn how to safely handle, holster, load and reload your handgun as well as how to deal with malfunctions or stoppages. Develop the skills necessary to effectively defend yourself and your loved ones. (You will be shooting closer groupings and have better site on target skills before the end of these courses as well as learn how to shoot on the move, use cover and other defensive tactics). 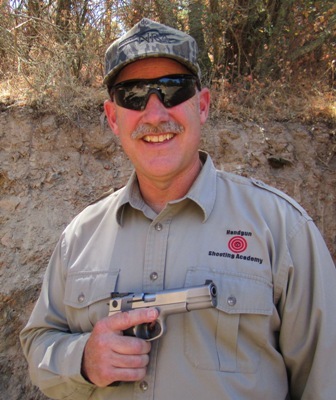 As a former police officer and a life-long shooting enthusiast Cary Talbott has created a safe, affordable and thorough way for handgun owners to develop the knowledge, skills and attitude necessary for responsible handgun ownership. During Police Academy, from which Cary graduated salutatorian, he completed both departmental and FBI firearms training. Subsequent to law-enforcement training Cary got involved in competitive shooting, is a Califormia DOJ Certified Instructor, P.O.S.T. Certified Law-Enforcement Firearms Instructor, an NRA Life Member, NRA certified Range Safety Officer, NRA Basic Pistol Instructor and has been instructing for the past 10 years. While seeking courses to continually master his skills Cary realized the scarcity of quality firearms instruction courses and has dedicated himself to developing comprehensive and fool-proof firearms training courses. Cary provides focused firearms training for those clients choosing to be better prepared than the adversary that is threatening their life or the life of a loved one.